Check out what we’ve been up to the last 12 months with our 2012/2013 annual report. The report includes a message from our director, highlights of our Collections, Information Management, Reference and Research Services, and Access Services departments as well as updates on the professional activities of the staff and of various projects. 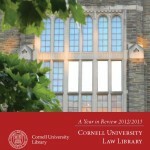 Some of the features include the visit of Bitner Research Fellow Priya Rai, the return of ever-popular therapy animals, an update on the law school construction project and the award-winning Trial Pamphlets digitization project. This month marks the 150th anniversary of the Gettysburg Address. The speech is sometimes referred to as the greatest closing argument in history, in part because Lincoln himself spent his early career as a lawyer in Illinois. The law library has numerous books available for checkout detailing Lincoln’s career as a lawyer and covering his skill as an orator. One of the more recent examples is Arthur Rizer’s Lincoln’s Counsel: Lessons from America’s Most Persuasive Speaker, published by the American Bar Association. Before Abraham Lincoln was called “Mr. President,” he was called “counselor” and “esquire.” Some consider him to be one of the nation’s greatest attorneys and, at the very least, an enormously persuasive speaker. He spent more years practicing law than any other president, and his years in the legal profession were essential to his eventual election to the Presidency. As a lawyer, Lincoln knew how to craft successful closing arguments. 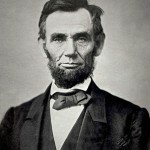 As a president–with his Gettysburg Address, perhaps the greatest closing argument in history–he knew how to persuade a bitterly divided country into ultimately doing what was right for all. Through examples from Lincoln’s great speeches and closing arguments–included in their entirety are Lincoln’s First and Second Inaugural Speeches, the Gettysburg Address, the Emancipation Proclamation and more–this book instructs you in the art of persuasion in two simple ways: by providing lessons from Lincoln’s career as a lawyer and politician, and then by analyzing those lessons and discussing how to apply them to your own life. Lincoln’s Counsel gives important advice about advocacy straight from the very best. Also, due to Cornell possessing one of the original copies of the address, be sure to check out the commemorative events taking place around campus this month by visiting the university’s events calendar here.